From Administration, Panels go to Appearance > Themes. Click Browse. Locate education-minimal-pro.zip theme in your computer. Select education-minimal-pro.zip and click Install Now. Unzip education-minimal-pro.zip to your Desktop. Using an FTP client to access your host web server, go to /wp-content/themes/ and upload your new copy of the education-minimal-pro theme. After Activating Theme, you will see the notice offering you to install required plugins. Go to Post, Click Add New. Add Title, Content, Feature Image and Categories. Go to Page, Click Add New. Add Title, Content and Feature Image. 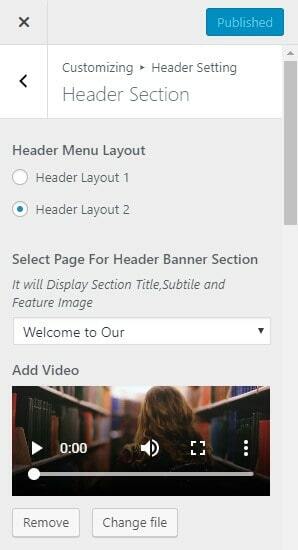 Header Menu Layout: Here you will get header menu layout for your site. 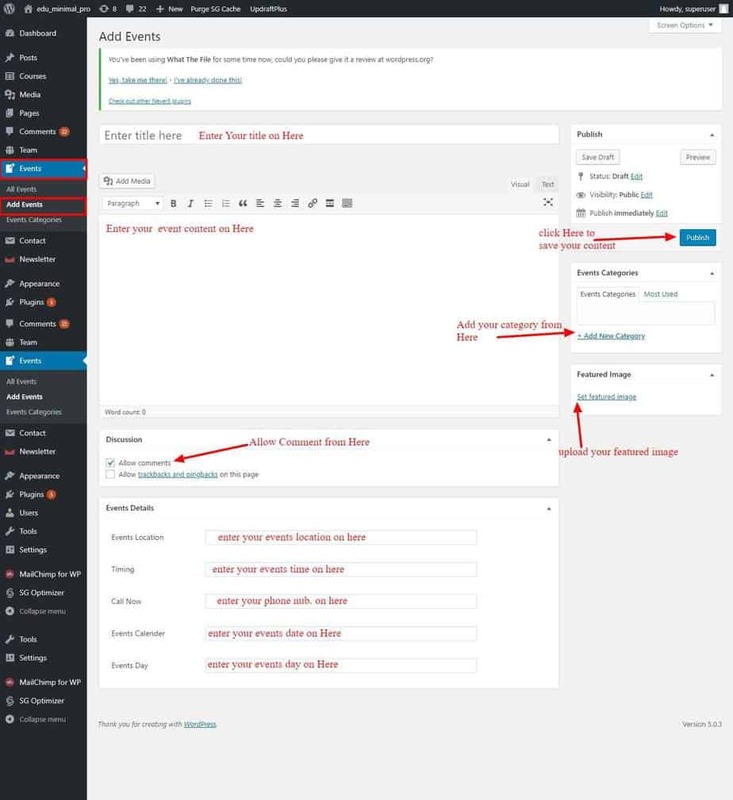 Header Layout 1: This option helps you to set Hader layout first. 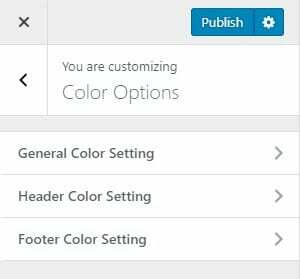 Header Layout 2: This option helps you to set Hader layout second.After Choose this layout you will get following option. Add Video: Here you can add your video. Menu Title: Here you can edit the First menu title. Menu Title: Here you can edit the second menu title. Apply Now Page: Here you can select apply now page. Contact Us Page: Here you can select Contact Us Page. Menu Title: Here you can edit the third menu title. Menu Title: Here you can edit the fourth menu title. Mobile Version Image: This Option help you to select image for the mobile version. 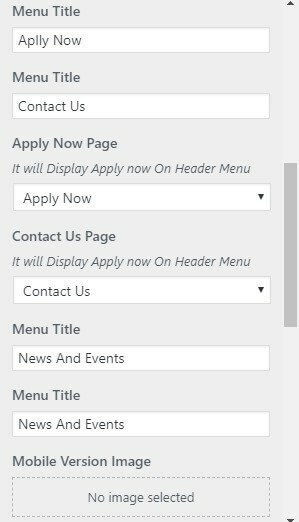 Select Category For Header Menu Category: Here you can select a category for the Header menu category. No. of Post On Category: You can select a number of post on a category. Enable/Disable Audio: This option allows you to enable/disable audio in video. 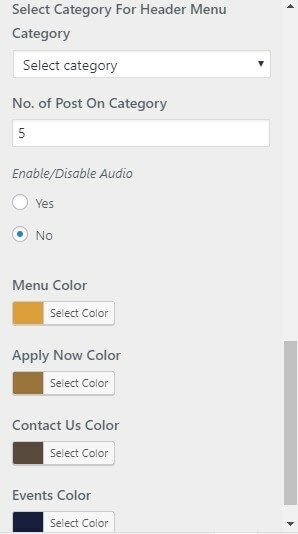 Menu Color: This option helps you to choose menu color. Apply Now Color: This option helps you to choose Apply Now Color. Contact Us Color: This option helps you to choose Contact Us Color. 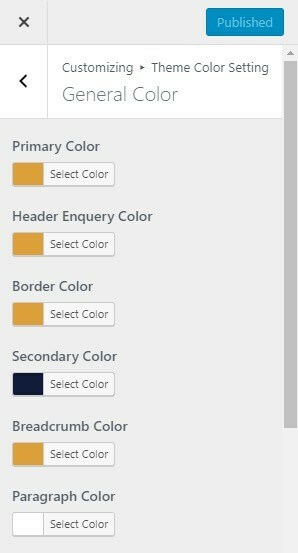 Events Color: This option helps you to choose Events Color. 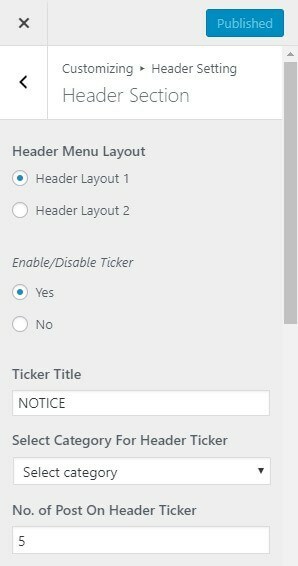 Enable/Disable Ticker: This option helps you to enable/disable ticker section on your site. Ticker Title: This option helps you to edit ticker title. Select Category For Header Ticker: This option helps you to select category for header ticker. No. of Post On Header Ticker: This option helps you to select no of post on Header ticker. Enable/Disable Header Social: This option helps you to enable/disable header social icon. 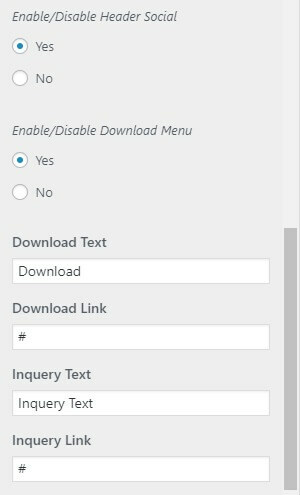 Enable/Disable Download Menu:This option helps you to enable/disable download menu. Download Text: This option helps you to edit download text. Download Link: This option helps you to set a link in a download. Inquiry Text: This option helps you to edit an Inquiry text. Inquiry Text Link: This option helps you to set a link in an Inquiry. 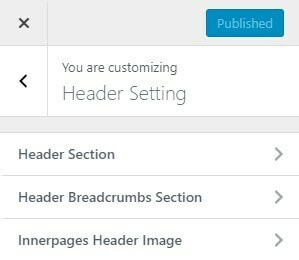 Enable/Disable Header BreadCrumbs: This option allows you to enable/disable header breadcrumbs. Enable/Disable Search On Innerpage: This option allows you to enable/disable search on the inner page of your site. 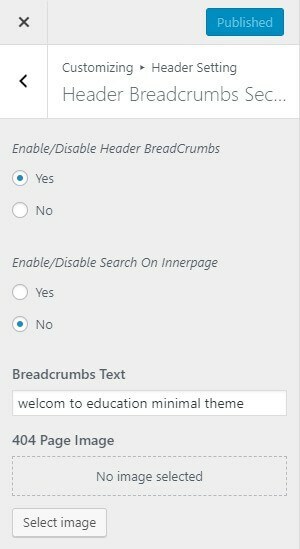 Breadcrumbs Text: This option allows you to edit breadcrumbs text. 404 Page Image: This option allows you to select 404 page image. 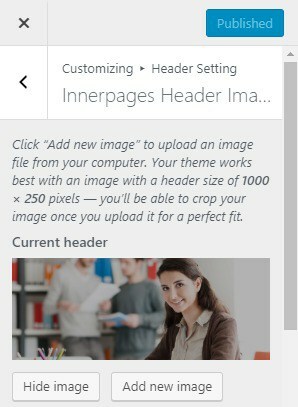 From Customize > Header setting >Innerpages Header image.From Innerpages Header image you can change the header image of the inner pages header image. 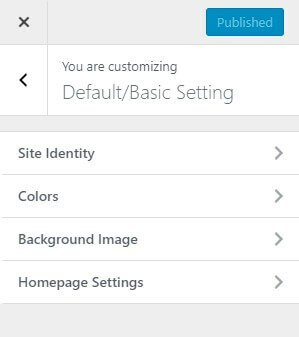 From the Customize > Default/Basic Setting section, go to Site Identity. You will see a various option. Logo only: This option helps you to enable logo only. Logo + Tagline: This option helps you to enable logo and tagline only. Title Only: This option helps you to enable logo only. Title + Tagline: This option helps you to enable logo only. 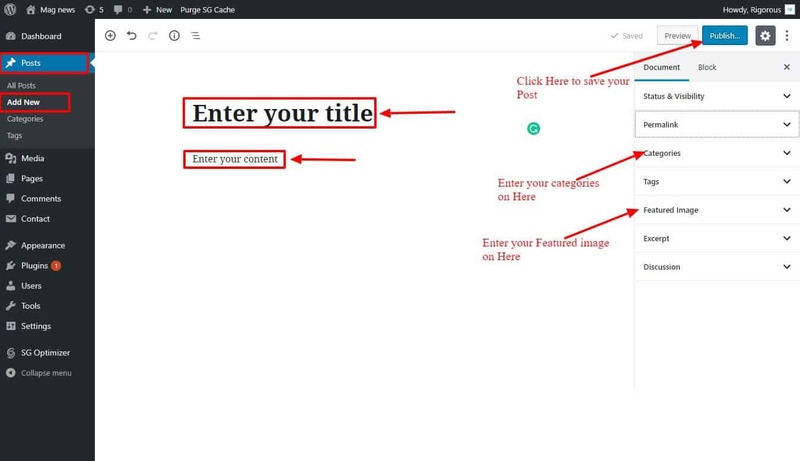 Display Site Title and Tagline: This option helps you to disable and enable Site Title and tagline in your site. 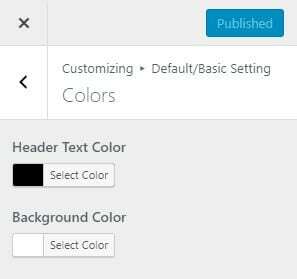 Header Text Color: Choose Header Text Color using this option for your website. Background Image: This option help you to set background image of your website. Preset: This option helps you to set preset option. From The Customize section, go to Theme color Setting > General Color Setting. 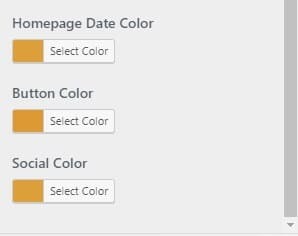 In General Color Setting, you can choose differently for Primary Color, Secondary Color, Social Color, Border Color, Breadcrumb Color, Header Inquiry, Paragraph Color, Homepage Date Color, Button Color. 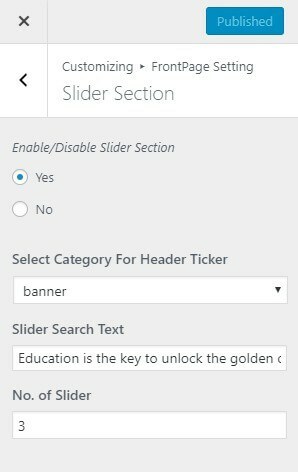 Enable/Disable Slider Section: This option allows you to enable/disable slider section. Select Category For Header Ticker: This option allows you to select a category for Header Ticker. Slider Search Text: This option allows you to edit slider search Text. No. of Slider:This option allows you to select a number of the slider. Enable/Disable About Section: This option allows you to enable/disable about us section. 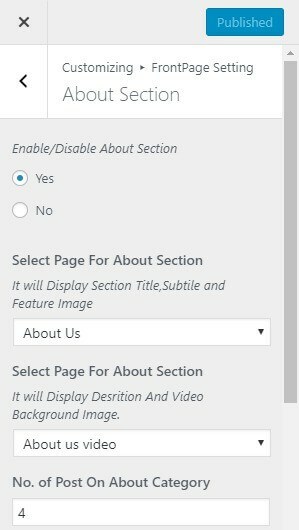 Select Page For About Section: This option helps you to select the page for about section. It will Display Description And Video Background Image. No. of Post On About Category: This option helps you to select a number of post on about category. Select Category For About Us Section: This option helps you to select the category for about us section. 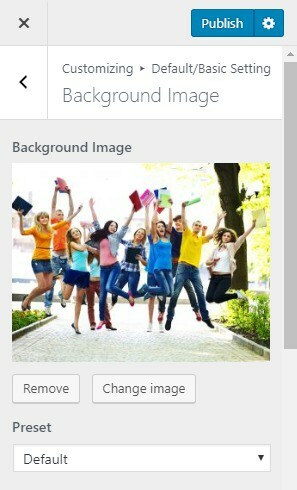 About Background Image: This option helps you to select about background image. Type Video URL For About Section: This option helps you to put video URL for about section. Enable/Disable Counter Section: This option allows you to enable/disable counter section. Select Page For Counter One: This option helps you to select a page for Counter one.This Page Will Display Feature Image And Title. counter Number One: This option helps you to set a counter number of counter one. 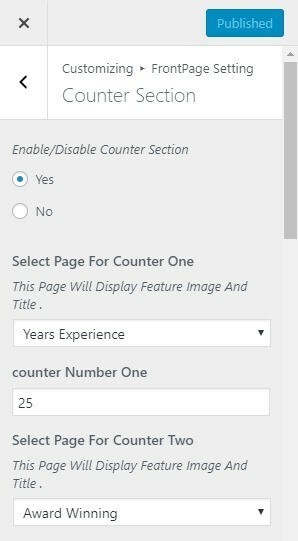 Select Page For Counter Two: This option helps you to select a page for Counter two.This Page Will Display Feature Image And Title. Counter Number Two: This option helps you to set a counter number of counter two. 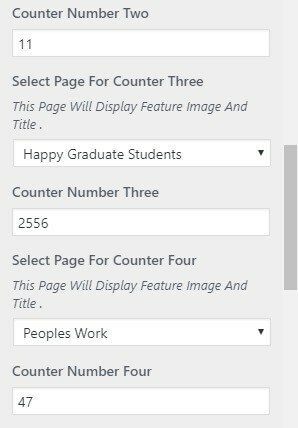 Select Page For Counter Three:This option helps you to select a page for Counter three.This Page Will Display Feature Image And Title. Counter Number Three: This option helps you to set a counter number of counter three. Select Page For Counter Four:This option helps you to select a page for Counter four.This Page Will Display Feature Image And Title. Counter Number Four: This option helps you to set a counter number of counter Four. Counter Image: This option helps you to set a counter image. Counter Background Image: This option helps you to set a counter background image. Enable/Disable Feature Section: This option allows you to enable/disable Feature section. 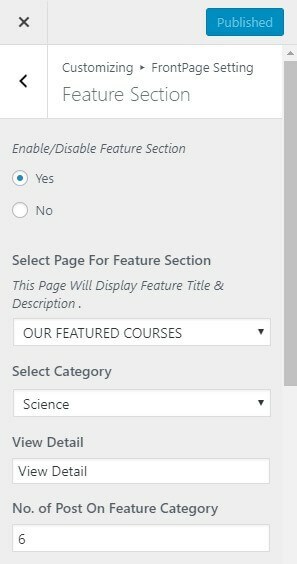 Select Page For Feature Section: This option allows you to select a page for feature section.This Page Will Display Feature Title & Description. Select Category: This option allows you to select a category for the feature section which is come from the plugin. View Detail: This option allows you to edit view Detail button. No. of Post On Feature Category: This option allows you to set a number of post on feature section to show in your site. 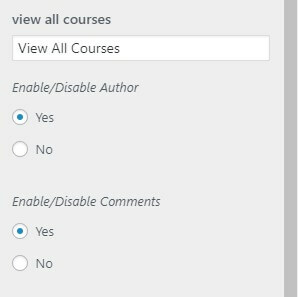 view all courses: This option allows you to edit view all Detail button. Enable/Disable Author: This option allows you to enable/disable author. Enable/Disable Comments: This option allows you to enable/disable Comments. After activation the plugins Education Minimal Components you will fund the Courses Custom Post Field. Then You can add the Courses As Follows. Enable/Disable Testimonial Section: This option allows you to enable/disable Testimonial Section. 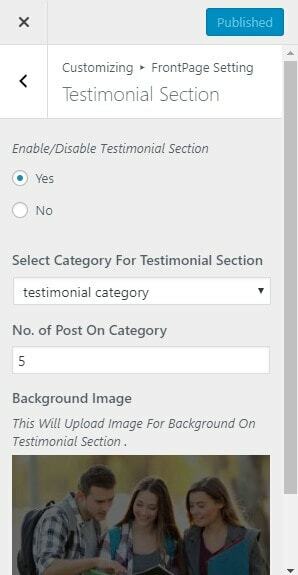 Select Category For Testimonial Section: This option allows you to select a category for Testimonial Section. No. of Post On Category: This option allows you to select a number of post on a category. Testimonial Background Image: This option allows you to select testimonial Background Image. Enable/Disable Team Section: This option allows you to enable/disable Team Section. 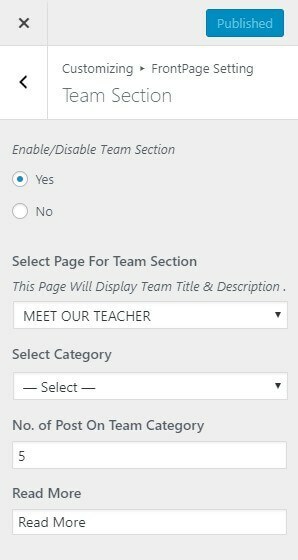 Select Page For Team Section: This option allows you to select a page for Team Section.This Page Will Display Team Title & Description. 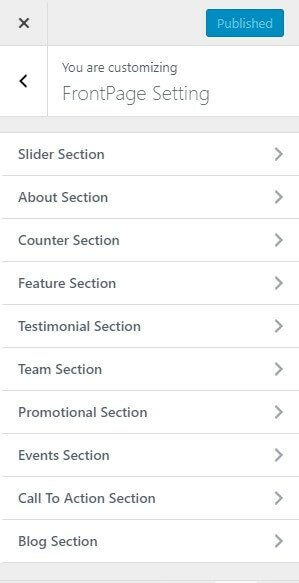 Select Category: This option allows you to select a category for Team Section. No. of Post On Team Category: This option allows you to select a number of post on a Team category. 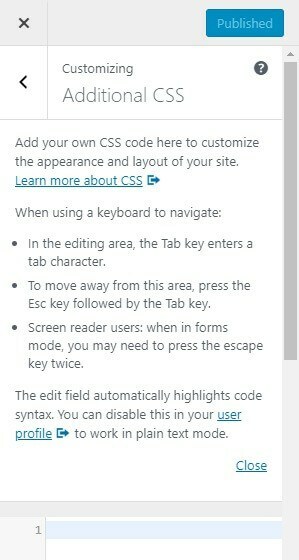 Read More: This option allows you to edit read more button. After activation the plugins Education Minimal Components you will fund the Team Custom Post Field. Then You can add the Team As Follows. Enable/Disable Promotional Section: This option allows you to enable/disable Promotional Section. 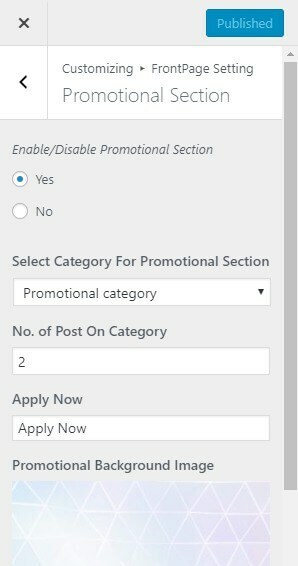 Select Category For Promotional Section: This option allows you to select a category for Promotional Section. No. of Post On Promotional Category: This option allows you to select a number of post on a Promotional category. Apply Now: This option allows you to edit apply now button. Promotional Background Image: This option allows you to select a promotional background image. Enable/Disable Events Section: This option allows you to enable/disable events section. 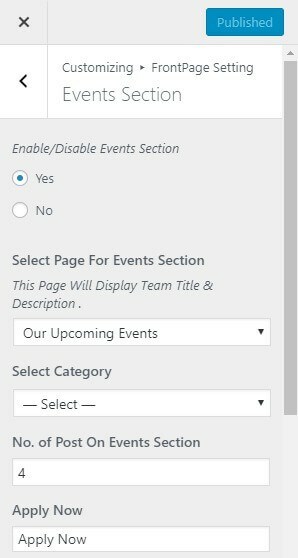 Select Page For Events Section: This option allows you to select a page for events section.This Page Will Display Team Title & Description. Select Category: This option allows you to select a category for events section. No. of Post On Events Section: This option allows you to select a number of post on events section. 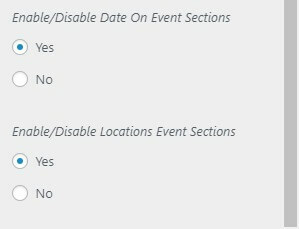 Enable/Disable Date On Event Sections: This option allows you to enable/disable date on event section. 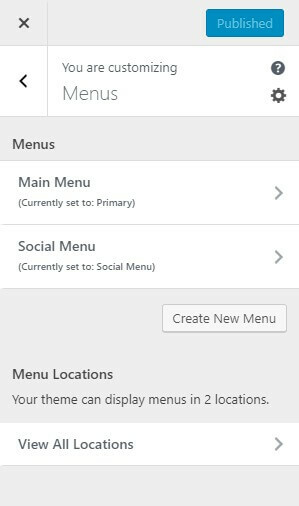 Enable/Disable Locations Event Sections: This option allows you to enable/disable locations event sections. 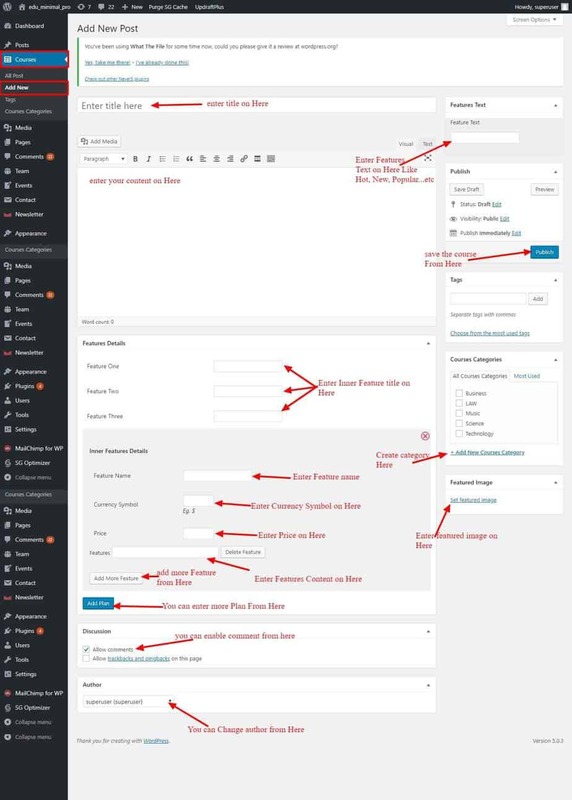 After activation the plugins Education Minimal Components you will fund the Event Custom Post Field on Dashboard. Then You can add the Events As Follows. 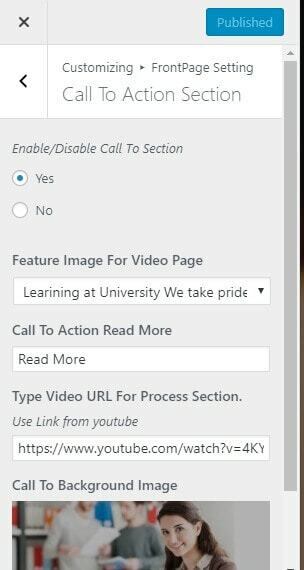 Enable/Disable Call to action Section: This option allows you to enable/disable Call to action Section. Feature Image For Video Page: This option allows you to select feature image for video page. Call To Action Read More: This option allows you to edit call to action read more button. Call to action Background Image: This option allows you to select a Call to action background image. 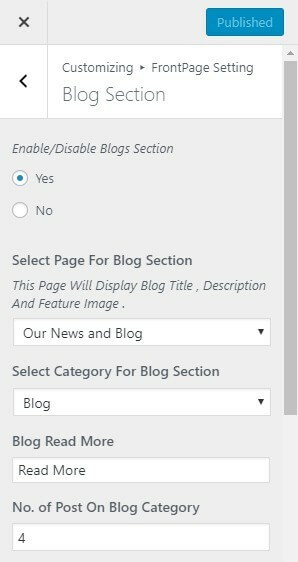 Enable/Disable Blog Section: This option allows you to enable/disable blog section. 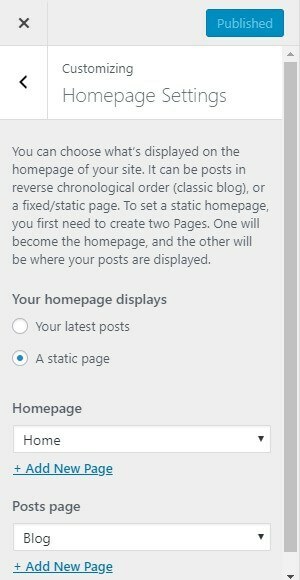 Select Page For Blog Section: This option allows you to select a page for blog section.This Page Will Display Feature Title & Description. 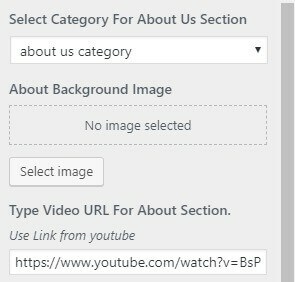 Select category For Blog Section: This option allows you to select a category for the blog section. Blog Read More: This option allows you to edit Blog Read More button. No. of Post On Blog Category: This option allows you to set a number of post on Blog section to show in your site. Enable/Disable Blog Date Sections: This option allows you to enable/disable Blog Date Sections. 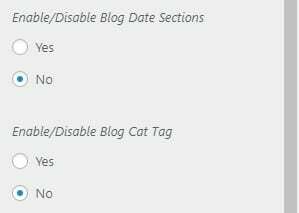 Enable/Disable Blog Cat Tag: This option allows you to enable/disable Blog Cat Tag. 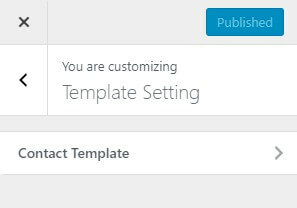 Select Page For Contact Templates: This option helps you to select a page for contact templates.This Page Will Display Title. 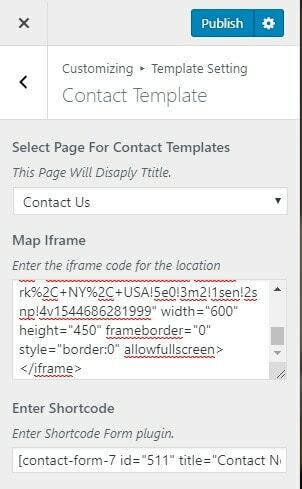 Map Iframe: Enter the iframe code for the location. 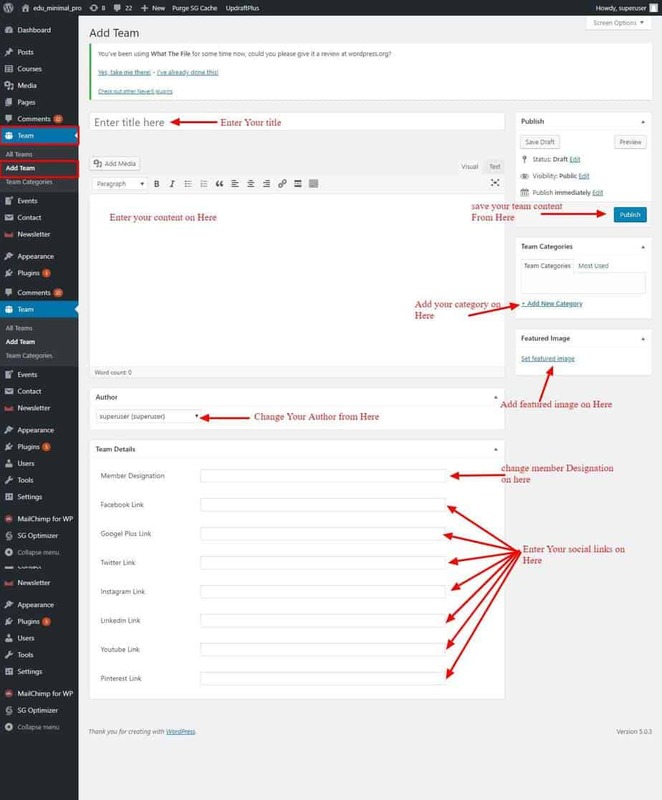 Enter Shortcode: Enter Shortcode for Form plugin. Read More: This option helps you to edit read more button. Enable/Disable Read More: This option helps you to enable/disable read more button. 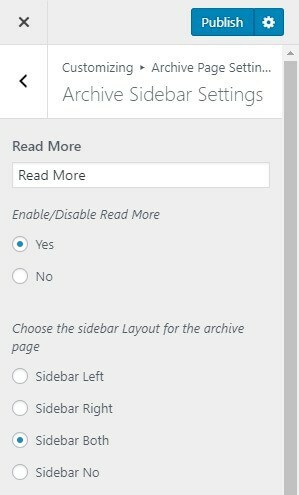 Choose the sidebar Layout for the archive page: Here you can choose sidebar layout for the archive page. Sidebar Left: This option helps to set your sidebar to the left side. 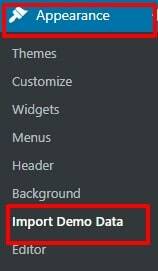 Sidebar Right: This option helps to set your sidebar to the right side. Sidebar Both: This option helps to set your sidebar to both sides. 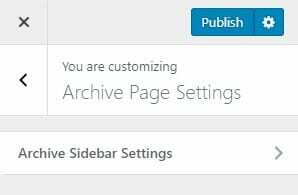 Sidebar No: This option helps to set no sidebar in your site. Pagination Options: Here you can choose a pagination option. Default: This option helps to set Default pagination. Numeric: This option helps to set Numeric pagination. 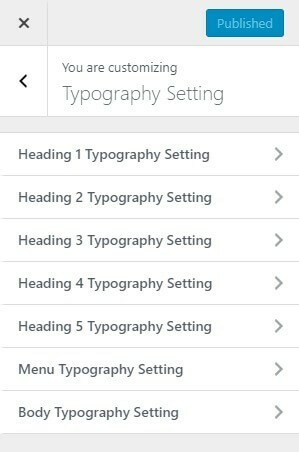 Go to Appearance > Customize > Typography Setting > Heading 1 Typography Setting. where you can manage Heading 1 Typography Setting. Heading 1 Font Size:This option help you to select Heading 1 Font size in your site. Heading 1 Font:This option help you to select Heading 1 Font Family in your site. 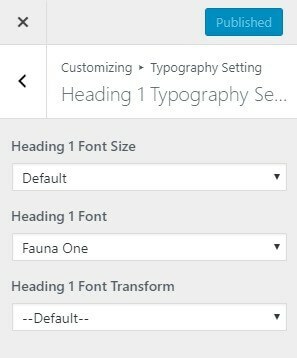 Heading 1 Font Transform:This option help you to select Heading 1 Font Transform(Normal,Uppercase,lowercase…) in your site. Go to Appearance > Customize > Typography Setting > Heading 2 Typography Setting. where you can manage Heading 2 Typography Setting. Heading 2 Font Size:This option help you to select Heading 2 Font size in your site. Heading 2 Font:This option help you to select Heading 2 Font Family in your site. 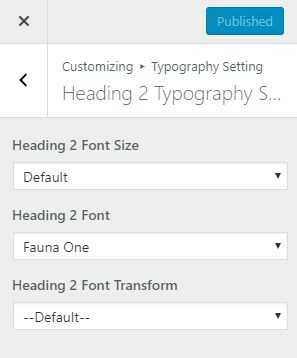 Heading 2 Font Transform:This option help you to select Heading 2 Font Transform(Normal,Uppercase,lowercase…) in your site. Go to Appearance > Customize > Typography Setting > Heading 3 Typography Setting. where you can manage Heading 3 Typography Setting. Heading 3 Font Size:This option help you to select Heading 3 Font size in your site. Heading 3 Font:This option help you to select Heading 3 Font Family in your site. Heading 3 Font Transform:This option help you to select Heading 3 Font Transform(Normal,Uppercase,lowercase…) in your site. Go to Appearance > Customize > Typography Setting > Heading 4 Typography Setting. where you can manage Heading 4 Typography Setting. Heading 4 Font Size:This option help you to select Heading 4 Font size in your site. Heading 4 Font:This option help you to select Heading 4 Font Family in your site. 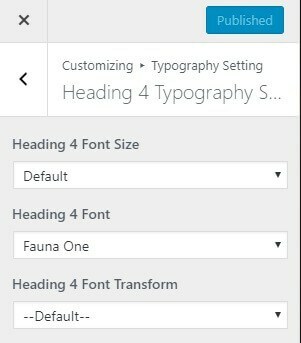 Heading 4 Font Transform:This option help you to select Heading 4 Font Transform(Normal,Uppercase,lowercase…) in your site. Go to Appearance > Customize > Typography Setting > Heading 5 Typography Setting. where you can manage Heading 5 Typography Setting. 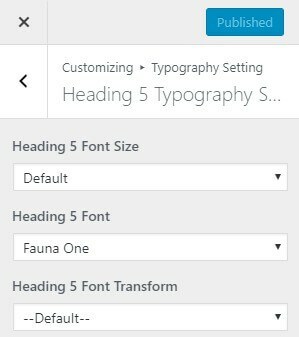 Heading 5 Font Size:This option help you to select Heading 5 Font size in your site. Heading 5 Font:This option help you to select Heading 5 Font Family in your site. Heading 5 Font Transform:This option help you to select Heading 5 Font Transform(Normal,Uppercase,lowercase…) in your site. Go to Appearance > Customize > Typography Setting > Menu Typography Setting. where you can manage Heading 5 Typography Setting. 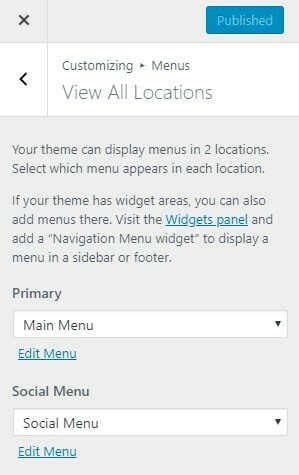 Menu Size:This option help you to select Menu size in your site. Menu Font:This option help you to select Menu Family in your site. 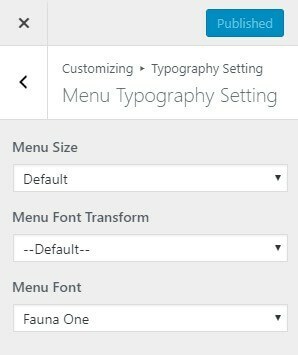 Menu Transform:This option help you to select Menu Transform(Normal,Uppercase,lowercase…) in your site. 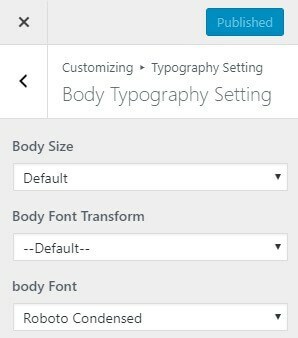 Go to Appearance > Customize > Typography Setting > Body Typography Setting. where you can manage Body Typography Setting. Body Font Size: This option help you to select body Font size in your site. Body Font: This option help you to select body Font Family in your site. Body Font Transform: This option helps you to select body Font Transform(Normal, Uppercase, lowercase…) in your site. 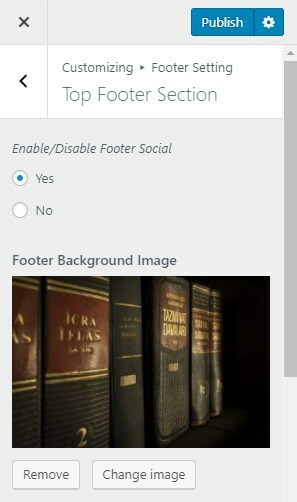 Enable/Disable Footer Social: This option helps you to enable/disable footer social link. Footer Background Image: This option helps you to select footer background image. 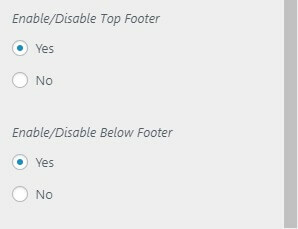 Enable/Disable Top Footer: This option helps you to enable/disable top footer. Enable/Disable Below Footer: This option helps you to enable/disable below the footer. 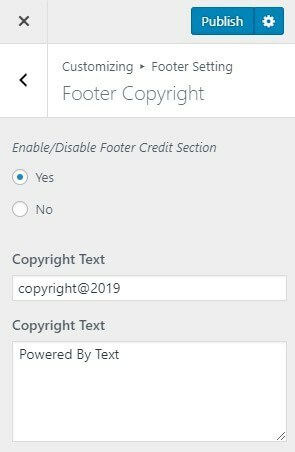 Enable/Disable Footer Credit Section: This option helps you to enable/disable footer credit section. 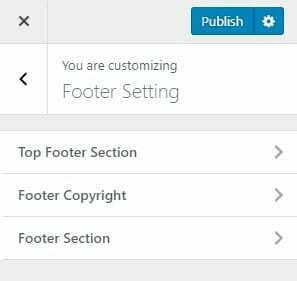 From Customize, go to Footer Setting > Footer Section. 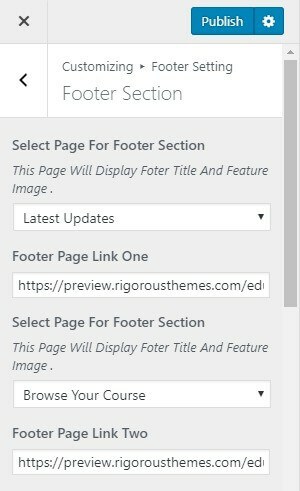 In Footer Section, you can put especially four-page for that you have to select the page from each page and put a link for it. 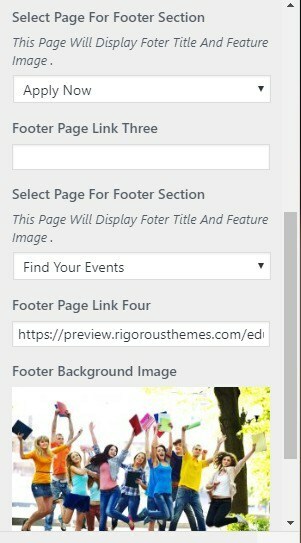 Select Page For Footer Section: This option helps you to select page for footer section .This Page Will Display Foter Title And Feature Image . similar process you can do for other three page. Footer Page Link One: This option helps you to put the footer page link. Similar process you can do for other three page. From Widgets, you will see different sections to add widget where you will be able to Add a Widget or Remove widgets by going to a particular widget section. And the added widget will be displayed in a particular section that you have added. Note: Make sure to add proper widgets in proper widget area for the best result. 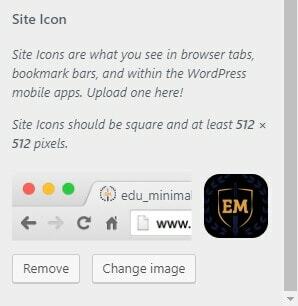 Education Minimal: Top Footer: You will find options and settings in this widget. Now setup the widget according to your need. See the below image. EDUCATION MINIMAL: Feature Details: You will find options and settings in this widget. Now setup the widget according to your need. See the below image. 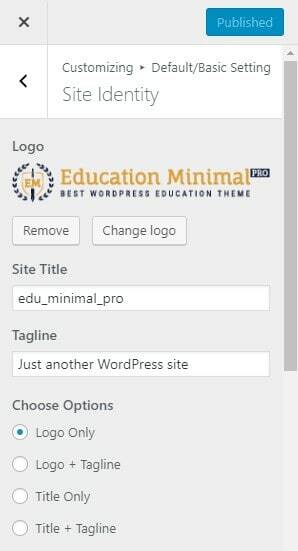 EDUCATION MINIMAL: Recent Posts: You will find options and settings in this widget. Now setup the widget according to your need. See the below image.